"This study shows a significant improvement in the sleep duration of students, all by delaying school start times so they're more in line with the natural wake-up times of adolescents," says senior author Horacio de la Iglesia, a University of Washington researcher and professor of biology. Seattle's switch to later start times is still unusual for school districts around the country, where school typically starts around 8 a.m. 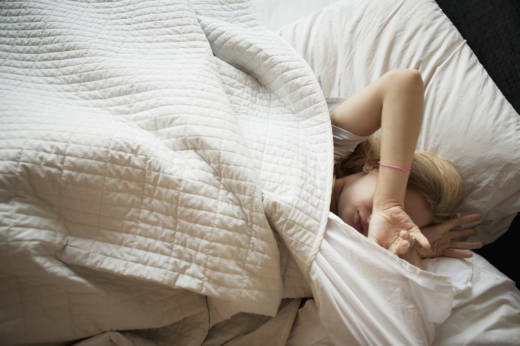 In 2014, the American Academy of Pediatrics issued a policy statement calling on school districts to move start times to 8:30 a.m. or later for middle and high schools so that students can get at least 8 1/2 hours of sleep a night. But according to the National Center For Education Statistics, only 17 percent of public middle and high schools, including some school districts in Minnesota and Kentucky, start at 8:30 a.m. or later. Getting a little extra sleep in the morning can be vital for teens, explains de la Iglesia. Once children reach puberty, their biological clock changes. "They fall asleep later than older adults and young kids," he says. Teens' biological bedtime is more like midnight, he says, and if parents expect them to go to sleep at 10 p.m., it often doesn't work. "They'll just lay in bed and not fall asleep," he says. Of course, this means teens need to sleep later in the morning. "To ask a teen to be up and alert at 7:30 a.m. is like asking an adult to be active and alert at 5:30 a.m.," says de la Iglesia. In the study, researchers compared two separate groups of sophomores enrolled in biology classes at two Seattle high schools, Franklin High School and Roosevelt High School. The first group of 92 students, drawn from both schools, wore wrist monitors to track their sleep for two-week periods in the spring of 2016, when school still started at 7:50 a.m. The wrist monitors collected information about light and activity levels every 15 seconds so researchers could determine when students were awake and when they were asleep. In 2017, after schools changed start times to nearly one hour later, researchers looked at a group of 88 students taking the same biology classes. They also wore wrist activity monitors and kept a sleep diary. You might think that when school starts later, teens will just stay up later. But that's not what researchers found. Bedtimes stayed relatively constant and kids caught some extra sleep in the mornings. "We've put them in between a rock and a hard place where their biology to go to bed later fights with societal expectations," says lead researcher Gideon Dunster, a graduate student studying sleep at the University of Washington. "Thirty-four minutes of extra sleep each night is a huge impact to see from a single intervention," says de la Iglesia. The study also shows a link between getting more sleep and better academic performance. Students who took the biology class after the later start time got final grades that were 4.5 percent higher than students who took the class when it started earlier. That could be the difference between an A and a B, says de la Iglesia. He says sleep deprivation makes it more difficult to learn and to retain new information. Even though researchers can't be sure that more sleep gave students an academic edge, the school's biology teachers say the difference was striking. "When we started at 7:50 a.m. there would always be stragglers who were having a hard time getting here," says Cindy Jatul, who teaches biology at Roosevelt High School. Students were groggy and noticeably different from students who took her class later in the day. "For example, if I gave them a project in the lab, they would be the most likely class to mess up," she says. Franklin High School science teacher A.J. Katzaroff says "there was lots of yawning" when school started at 7:50 a.m. Students had a hard time engaging in the work or in brief discussions, which is extremely unfortunate. "Some of the best practices in science education have students talk, discuss and investigate together and those are all very hard when the brain is not fully powered," Katzaroff says. After the time switch, many more kids were able to engage in deeper thought and scientific discourse. Katzaroff says. The number of students who were tardy or absent also decreased significantly, putting Franklin High School — which is in a low-income neighborhood — on par with students from a higher-income neighborhood. The later school start time gave them a better opportunity to make it to school on time. "We need to give every bit of equity we can for kids in lower socio-economic families," says Dr. Cora Collette Breuner, spokesperson for the American Academy of Pediatrics and professor of pediatrics at the University of Washington School of Medicine. Breuner was not involved in the study. Breuner calls the findings "exciting" and says that while an extra 34 minutes of sleep might not sound like a lot to the average person, when it comes to sleep "every minute counts." Breuner says that while only a handful of school districts nationwide have switched to later start times, that is changing "as counties and cities like Seattle make changes and see positive benefit."